Today started out as usual. Get up, wake Luke up, brush my teeth and wash my face and feed Luke some breakfast and see him out the door for school. Feed Natalie breakfast, home school her, work out, take a shower. By that time, it's time to pick Luke up from school and feed everybody lunch and home school Luke. My husband works from home but goes into the office once a week for a catch up meeting with his co-workers and today was the day he went in. In a medium pot, heat 1 tablespoon oil over medium-high. 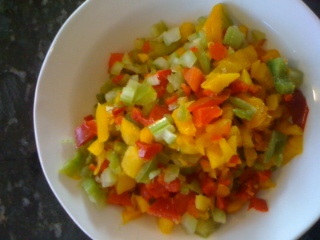 Add celery, bell peppers, and onion and season with salt and pepper. Cook, stirring often until vegetables soften. 5 minutes. Stir in rice and 1 1/2 cups water; bring to a boil. Cover, reduce to a simmer, and cook until rice is tender, about 15 minutes. Remove pot from heat and let stand, covered 5 minutes. Fluff rice with a fork and stir in parsley. Meanwhile, in a small skillet, heat 1 teaspoon oil over medium-high. 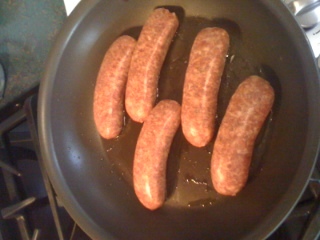 Add sausages and cook until browned on all sides, about 10 minutes. 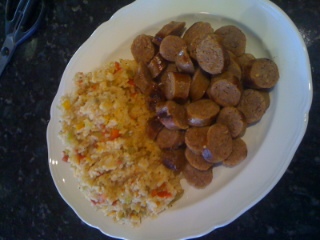 Reduce heat to low, cover, and cook until sausages are cooked through, 8 to 10 minutes. Let rest 2 minutes before slicing crosswise. In a medium bowl, toss spinach with vinegar and 2 teaspoon oil. Season to taste with salt and pepper; serve spinach alongside rice and sausages. Let's see, do I have any notes for this recipe? My hubby and I found the rice to be extremely colorful but it was on the bland side. Nothing a little more salt and pepper can't take care of. I'm off to admire my clean house. Thanks for stopping in!